Thursday night, Guangxi Sports Center, Nanning. 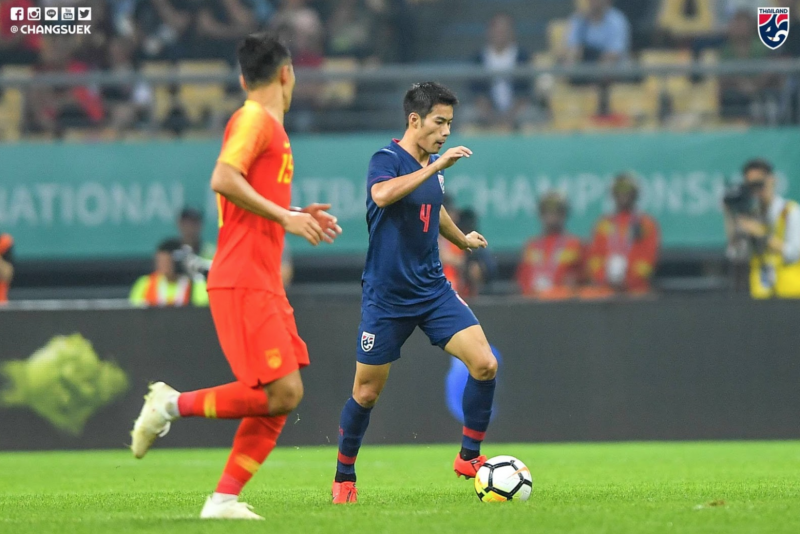 The Chinse national team, led by former World Cup winner and current Guangzhou Evergrande FC head coach Fabio Cannavaro, had just lost to Thailand 1-0. The defeat knocked Team Dragon out of the China Cup 2019, the Chinese FA’s friendly tournament. The War Elephant, on the other hand, continue through to the final on Tuesday against international powerhouse Uruguay. Caretaker coach Sirisak Yodyardthai, who replaced Milovan Rajavac during the AFC Asian Cup 2019, is still in charge of Thailand, and elected to recall many players who were previously preferred during Kiatisuk Senamuangs’ era, but overlooked by Rajavac. Winger Kroekrit Thaweekarn and right-back Narubadin Weerawatnodom never featured for Rajevac. Left-back Peerapat Notchaiya was given opportunities early on but failed to impress and was cut from the AFF Suzuki Cup and the AFC Asian Cup squads. Creative midfielder Sarach Yooyen only played for 45 minutes under the Serbian. All 4, together with the likes of Chanathip Songkrasin, were key members of Kiatisuk Senamuangs’ “Golden Generation” that dominated South East Asian football between 2014 and 2016. All four played some part in Thursday night’s victory, either in the starting XI or as a substitute. However, one player who stood out, in particular, was Sarach Yooyen of Thai League giants Muangthong United. There was slight doubt over Sarach’s ability to perform at the highest level after recovering from a long injury, but the 26-year-old was impressive upon his return to the national team setup. Sitting centrally in a 3-5-2, Sarach was a bit quiet in the first half as Thailand sat back, looking for the counter – and it was his clearance that led to the winning goal. To his delight, Sarach was offered extra space and license to roam in the second half as China pushed forward, trying to utilize their physical superiority through a more direct approach. The delicate midfielder was able to assert himself into the game with his short metronomic passing, which helped link up the War Elephant’s play. Once Sarach got into the rhythm, the whole team clearly looked more confident as they toyed around the opposition in little rondos all over the pitch, increasing their possession percentage to around 50/50 in some moments. Sarach even had a shot from the edge of the penalty area in the 71st minute, only for the ball to swoop inches away from the post. In a sense, this match is the opposite of how thing went last time both sides met 2 months earlier at the Asian Cup. During the tournament in the UAE, Thailand wanted to control possession from the get-go and was fortunate to score at the half-hour mark. 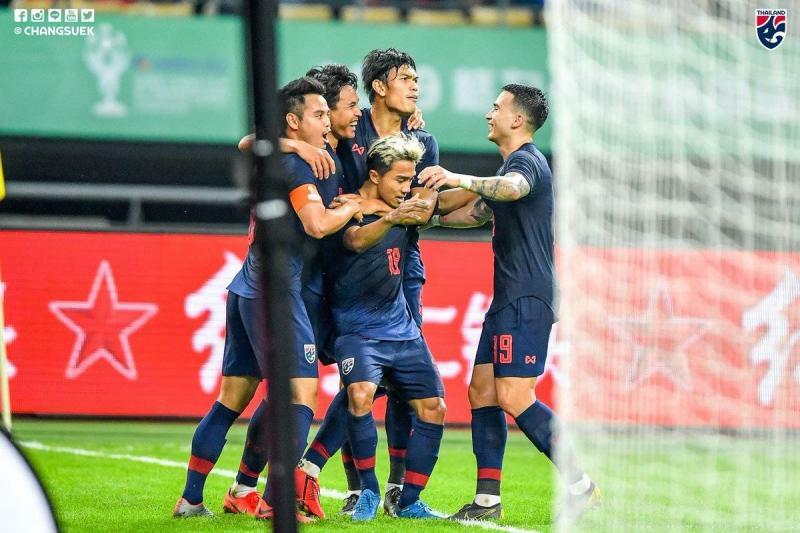 We don’t know if it’s Sirisaks’ idea or Chinas’ attacking intent (or perhaps both), but Thailand dropped significantly deeper in the second half and conceded by a close-range header in the 67th minutes. 4 minutes later, Team Dragon got their second goal after Chalermpong Kerdkaew’s rushed challenge gave away a penalty. Thailand’s inferior height advantage and tendency to mentally collapse when things go wrong means they might not be equipped to kill the game off by “parking the bus”. Having Sarach in the side offered a new tactical solution for coach Sirisak. Thailand can kill the game by keeping possession. And it’s true, Thailand have failed with this method before under coach Kiatisuk. However, the former National Team boss may have overemphasized Sarach-style playmakers, meaning his midfield lacked the steel to carry out such plans. This might all be speculation, but this is evidenced by the fact that no box-to-box midfielder has risen to prominence under Kiatisuk’s reign. While, on the other hand, Thitipan Puangchan and Pokklaw Anan have been competing for places under Rajevac. Chanathip Songkrasin, arguably Thailand’s best player, has never scored for Rajevac and always appear frustrated with the quality and quantity of passes delivered to him. This is not a surprise considering Rajevac’s pragmatic tactics and his clear preference for a dynamic box-to-box midfielder, such as Thitipan Puangchan, who he turned into a national team regular. The inclusion of Sarach brought back the central trio of Tanaboon Kesarat, Sarach, and Chanathip – the supposed Thai version of Busquets, Xavi and Iniesta. Kiatisuk found great regional success with this trio in his 4-3-3, but was defensively exploited on the continental level. Therefore, Sirisak and co. decided to fix this issue by shifting to the 3-5-2, using Thitipan’s engine for better balance in the transition from defense to attack and vice versa. In this system, Chanathip has both the support behind him and teammates alongside him to link up with, which could elevate his performances with the national team even further. Credits to the players and all coaching staff, as the triumph over hosts China is a great achievement. Additionally, the football on show was enjoyable. However, Thai fans must not overhype their expectation on Sarach just yet. The guy is clearly a fantastic player who has done well to recover from a horrific injury. In hindsight, maybe Rajevac should’ve given him more chances. But on the bright side, Sarach’s time away from the national team has reminded some fans how integral he is to the “Golden Generation” squad. The War Elephants’ game against Uruguay on Tuesday will be a massive test. If Sarach and the team can enjoy a few moments of brilliance then maybe everybody can start patting themselves on the back.